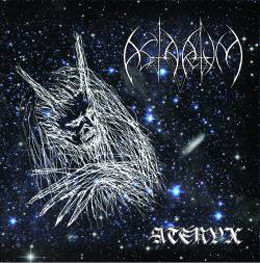 On November 11th 2014, Concreteweb put the review for Astarium’s Wyrm Of Melancholy online. It was kindly send to us by Metallic Media, which did send us this album, Atenvx, as well. Atenvx is the successor of Wyrm Of Melancholy, and the fourth full length by this Russian one-man army (led by Nikolay ‘SiN’; he’s also the guy behind Nitroatmosphericum Records – expect some more reviews by projects on this label in a very near future). It was initially released on tape on May 16th via Hell Division Productions, by the way. Very much in the vein of the former releases, Atenvx brings mid-tempo to fast-paced Black Metal with lots of synth-passages at the forefront. The multi-layered keyboard lines do carry the whole structure of the album once again, with the intro Crépuscule being the ideal opener to give you an idea. As a matter of fact, with exception of the vocals, all other instruments are inferior to the keyboard melodies. I do not want to denigrate the other instruments, but the guitar leads and rhythms, the bass lines and the drums are rather supportive, while those synths define the whole approach of Astarium. I want to come back to the vocals, which are mainly throaty-screaming, with some variations throughout the whole album. All right, they might sound somewhat forced and digitalized, yet still they go well with this orchestral, cosmic-magic material. The sound is quasi perfect once again, for being unpolished, yet properly mixed. The keyboards and vocals are not too overruling, the rhythm section is not too hollow but pretty recognizable (though, as you guessed in mean time, rather on the background). The fine-tuned and level-headed production strengthens the haunting, transcendental atmosphere. One final word concerning a comparison to the past. Atenvx is less melancholic than Wyrm Of Melancholy, and in general it’s faster and more orchestral (not necessarily heavily bombastic!). Therefor I think this album is closer related and more comparable to 2010’s Dethroned Of Impostor, but it’s just a remark of lesser importance, for Astarium have aa very own, characteristic sound and approach, which goes for every single release. But it’s just my duty as reviewer to mention this personal opinion. And finally this: in a couple of days you will find back the review for the new Astarium-recording, Nekrocosmo: Demiurge (besides, as mentioned before, some more Nitroatmosphericum-stuff).